I was extremely pleased with Kevin O'Brien. He was on time and did an awesome job. He posed for pictures and played throughout the house and outside. For our engagement / St. Patrick's day brunch party, he was absolutely perfect. He played very well and also played a smaller Bagpipe indoors to not be overbearing above conversations. I would highly recommend him. Wonderful service for my mother’s burial! We were so pleased with the performance yesterday. It was beautiful and meaningful! Thank you so much! Experienced and professional. Thanks again. 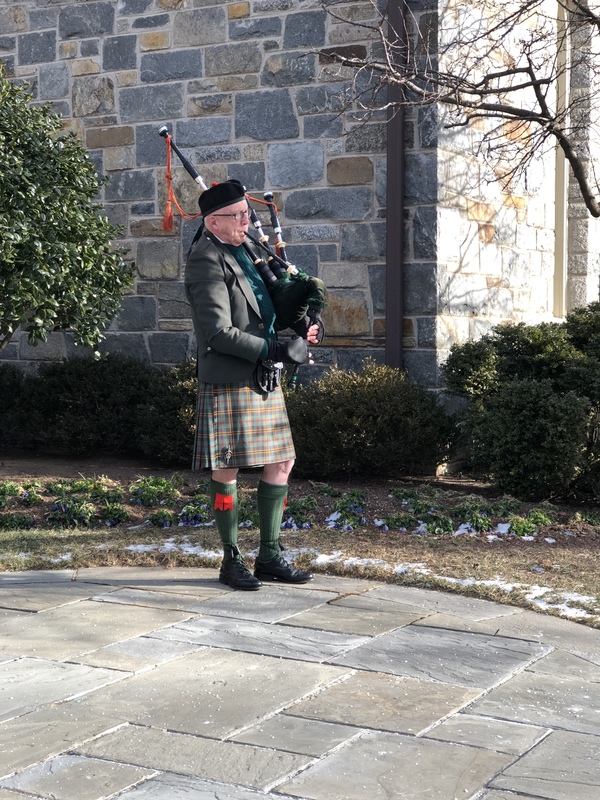 Kevin O'Brien provided a professional, heart felt bagpipe performance at the interment of my brother at Arlington National Cemetery. We all felt he was just perfect! Kevin's experience made this a hands off, no problem event. Thanks so much. We had many (all good ☺) comments on the music and how appropriate it was. Thanks again! Kevin was wonderful. So easy to work with. Flawless at three sites. Church. Grave site and reception. Kevin was very attentive to our special clients. We want to thank you for playing during our Memorial Service. It was a pleasure working with you on the arrangements. In addition to playing at the entering and exiting of the service, what was a surprise and truly brought tears to my eyes and others was your very timely playing a Amazing Grace in the service room. It was very memorable and heartfelt. Thank you for being a part of our Memeorial Service for my father. Thanks, Doug. That was very nice of you. Mr. O'Brien provided bagpiping music for my grandfather's funeral. He played as people arrived at the ceremony, as we moved the casket out of the church and again at the grave site. The sounds of the bagpipes were beautiful and brought joy to my grandmother throughout the day. His communication before the event made sure everything went very smoothly the day of. Thank you Mr. O'Brien. Mr. O'Brien made my Fathers Funeral some thing that my Father would of enjoyed to attend himself. He knew exactly what was needed to do before we even discussed the plans. Highly recommend him if you want a real piper. As an irish American that lived and went to school in Ireland as well as a former Officer in Clan Donald (MacDonald Clan), I think I know a few things about the pipes and what a good piper sound's like. Mr O'Brien is the real deal. Kevin was punctual, professional and talented. He played for my mother's funeral and the pipes were very moving to our family and friends. Keven played beautifully and was reverent during the service. Kevin O'Brien should be considered for any occasion a Piper may be needed. A high recommendation from myself for sure. Kevin was a pleasure to work with and was such a hit at my wedding! He showed up early and was super flexible (we had to move him around the venue because of the rain). He played so beautifully and walking down the aisle after we were married to "Scotland the Brave" was surreal. I would hire him again in a second! All of our guests kept talking about how great he was. I would recommend him in a heartbeat! Kevin was such a hit at my wedding!! He showed up early and was super sweet and flexible (we moved him around our venue because of last minute rain). The songs sounded gorgeous and walking down the aisle after our ceremony to "Scotland the Brave" was surreal. I would hire him again in a second! Everyone thought he was a great addition to the day. He did a beautiful job and my (now) husband and I couldn't be happier! 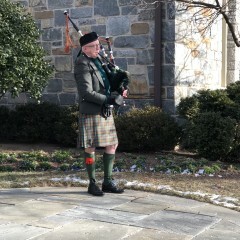 Mr. O'Brien performed on bagpipes for my brother's funeral and showed himself to be an exemplary musician, as well as a most pleasant personality. Patient with the inevitable delays, understanding of our needs, stoic in the hot weather, he added a special and unforgettable element to our solemn day. He was even willing to devise a version of a favorite melody and went the extra mile to see that his playing provided a beautiful background to the services. He was even willing to play in the parking lot as guests arrived and walked with us to the cemetery, a half mile there and back, playing all the while. Mr. O'Brien's kilt ensemble is authentic and his music haunting; all in attendance were charmed by him. I give Mr. O'Brien a top recommendation and only regret that I did not hire him for other events in the past. I cannot thank him enough for the generous time he spent, his kind demeanor, and his incredible talent.